Starting it's journey way up in the Australian Alps, the Murray River starts its long journey here finally ending at the mouth at the Southern Ocean in South Australia, over 2,520 kilometres away. There's a bone of contention as to where the river begins (its absolute beginning) from a tiny stream to the wide open space over 2530 kilometres away in South Australia. The closest town recognised at the beginning is Corryong. Famous for it's Man From Snowy River Festival, Corryong celebrates its classic heritage as an Alp town. We began our journey of the Murray from the small town of Towong not far from Corryong. The beautiful and pristine Murray starts as a small, unassuming river. Part of the Murray region to the mouth also begins at the Dartmouth Dam. Completed in 1979 the Dartmouth was built to hold additional storage for irrigation in New South Wales and Victoria. Journeying up the Dartmouth from Albury Wodonga is a great and easy alpine trip. Water from the Dartmouth is let out through the Mitta Mitta River. The Mitta Mitta River winds and flows down to the Hume Reservoir not far from Albury Wodonga. The roads wind alongside both rivers from the upper Murray and Mitta Mitta. This part of the valley is rich in farming and classic mountain scenes and is a rewarding visual experience. Also joining the Hume is the Murray River as it begins it's journey mostly westward then finally south from Morgan. Construction of the Hume Reservoir began in 1919 and was completed in 1936 as a need to assure irrigators of water supplies particularly following the harsh drought of 1914. 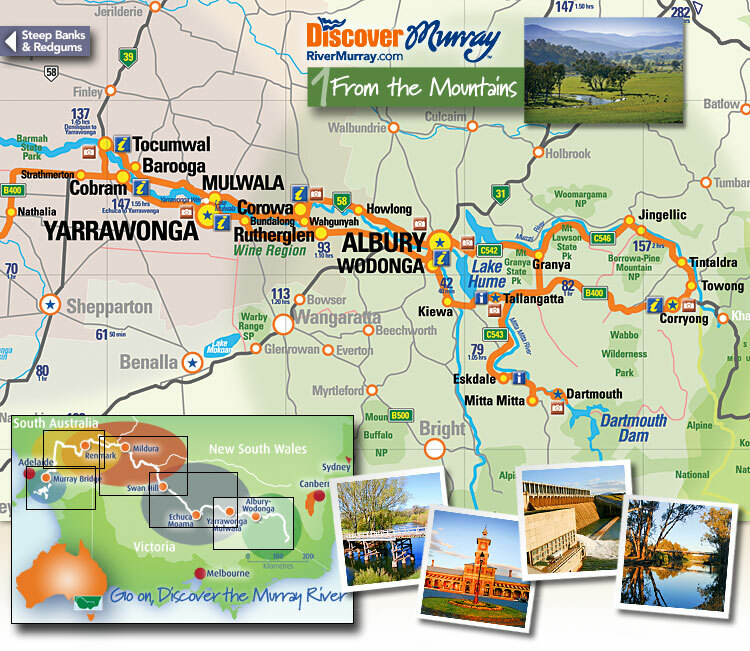 As the Murray flows, the first major town it enters is the twin town of Albury Wodonga. Australia's largest highway, the Hume crosses the Murray at this point. The original naming of the Murray River was the "Hume" by Hamilton Hume on 16th November 1824, in honour of his father. While his fellow traveller Captain William Hovell claimed to have named it in honour of his "fellow traveller, Hamilton Hume". The original sighting of the Murray River was by explorers Hume and Thomas Boyd near where Albury now stands. In 1830 Captain Charles Sturt at the Junction of the Darling-Murray, proclaimed the river "the Murray" to honour Sir George Murray, Secretary of State for the Colonies in the British Government which was officially accepted. Albury Wodonga is a beautiful city offering the opportunity to discover the best of the alps, amazing wines or simply relaxing in a great region of the Murray. The river around Albury flows fast and high. Since the days of locks and dams more river runs through Albury than in the past. Albury is a great place to experience the Murray onboard the paddlesteamer PS Cumberoona.